Many mysteries and myths surround the brilliant, tragic life of the great Edith Piaf...one of them that she was born on a pavement in a sleazy back street of Paris. 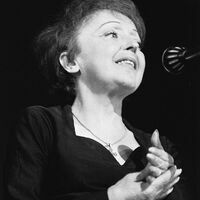 Her mother was a café singer, her father an acrobat and Piaf was reputedly raised by prostitutes when put in the care of her grandmother, who ran a brothel in Normandy. Constantly sickly, she first sang in public when she was 14, at her father's street entertainment shows. She became a mother at 17, but her daughter died of meningitis at two and Piaf herself lived on the streets singing for small change before being offered the chance to sing in a Pigalle night club. Gradually her fame grew as audiences fell under the spell of her unusually passionate and fiery style and she made 80 albums and toured the world's concert halls, performing dramatic signature songs La Vie En Rose and Je Ne Regrette Rien. Yet tragedy pursued her - the great love of her life, boxer Marcel Cerdan, died in a plane crash in 1949, she was seriously injured in a road crash in 1951 and became addicted to drugs and alcohol. She died of liver cancer in 1963 but Piaf - universally known as Little Sparrow - remains a singing legend and in 2007 a movie, La Vie En Rose, was made about her life. 2013 Parlophone Music France, A Warner Music Group Company. 2012 Parlophone / Warner Music France, A Warner Music Group Company.